Next comes one of the most critical operations in this project, the joining of the two major pieces. Everything has to be done just right because there's no going back if something isn't aligned properly. 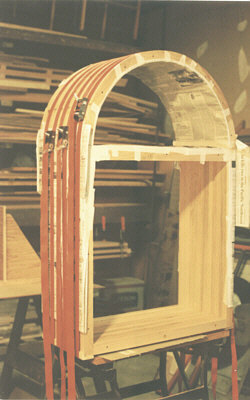 All inside surfaces have been sanded to their final finish and everything has been well masked to prevent glue from falling in the wrong place. All the biscuits are in their slots and the glue has been generously applied on all joining surfaces. The pieces are then brought together and gently nudged into place with appropriate mallet blows. As a last measure, several band clamps are used to apply great pressure thereby forcing the pieces together. After all is dry, we now have a one piece unit and we can begin finishing the outer surfaces.